I’ve been lucky enough to review some wonderful books from Other Press this year, so I was happy to agree to try the book reviewed in today’s post, especially as it’s a fairly short work. Of course, life gets in the way of the best-laid plans (as do other books…), and it spent a few months on the shelves before I finally got around to it. 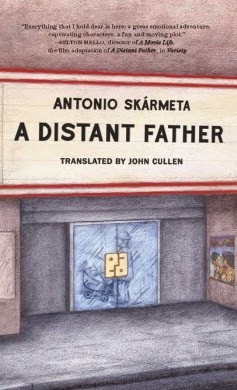 Antonio Skármeta’s A Distant Father (translated by John Cullen) is a short novella set in Contulmo, a small town in Chile. It’s the home of Jacques, a twenty-one-year-old schoolteacher, whose return home from teaching college coincided with his French father’s departure from the family home. Now, stuck in the dull town, alone with his mother in their small house, Jacques spends his days teaching whatever needs to be taught at the local school and his spare time translating poetry for a regional newspaper. A Distant Father is a beautiful little book, a story you can read through in a single-sitting (I did it twice, a week apart), a work which evokes the melancholy of youth and small-town blues. In a town where everyone knows everyone else, there isn’t much to do, and people tend to move away once they’re old enough. With few jobs, and a train service which is threatened with closure, it’s easy to agree with the comment that the world is not made for small towns. With alcohol only exacerbating his melancholy, Jacques needs other ways to escape from everyday life.